All the models have diecast bodies and hard-coated Alpo 75mm f/3.5 triplet lenses, and focus by moving the entire lens assembly. The Alpenflex I has an Orient II shutter (B, 1–200) with flash synchronization. Film positioning is via a red window. The later Alpenflex IS adds a self timer. (It was announced as having a Companion shutter, but all seem to come with Orient shutters.) They were distributed by 大光 and Tanaka Shōkai, and advertised in issues of the Japanese photo magazines from November 1952 until September 1953. The Alpenflex I(S) has a distinctive appearance, with a decorative metal plate with vertical lines attached to the front board around the taking lens. Perhaps such panache went out of style; anyway, no later model has this. A fairly early advertisement for the camera has the slogan "Comet of the TLR world" (Niganrefu-kai no suisei 二眼レフ界の彗星), showing a comet flying over both an Alpine mountain (most likely the Matterhorn) and the Alpenflex. Oddly, it mentions the distinction between the I and the IS, but gives a single price of ¥16,000 (including case): it's unclear whether this gets you the self-timer. The camera was again distributed by 大光. The advertisement also has a testimonial by Tanizaki Jun'ichirō that is, perhaps to the disappointment of Hachiyō, very much on the casual side. The Alpenflex IIO and Alpenflex IIS add a sports finder (you flip down the front of the hood, and can then look through it). They have a Kodak-style flash terminal (near the bottom of the front plate in earlier examples, near the viewing lens in later ones). The two differ by self-timer: the IIO lacks this and the IIS has it. They were advertised in issues of the Japanese photo magazines from February 1954 until April 1955, priced near the start at ¥16,000 and ¥17,000 respectively, but with the IIS later sold for as little as ¥11,000 as an inexpensive alternative to the Z. These and subsequent models were distributed by Misuzu Shōkai. According to announcements in magazines dated September 1954, an Alpenflex C (apparently never advertised) returns to a red window for film advance but has an "Algen" or similarly named shutter (B, 1–200; with flash synchronization and self-timer) and for the focusing control uses a laterally sliding lever near the bottom of the front (as used for the Minolta Autocord). 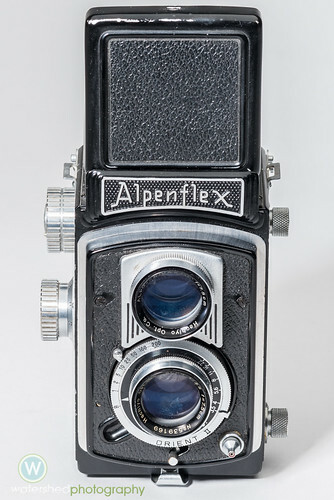 The Alpenflex Z was the last model. Film advance is semi-automatic, and the shutter is a Copal (B, 1–300; with PC flash synchronization and self-timer). It was advertised in issues of the Japanese photo magazines from May until December 1955, priced at ¥13,000. ↑ 1.0 1.1 The reading of this is unclear. It may well have been "Daikō", but could instead have been "Ōmitsu" or something else. ↑ There is an advertisement by Tanaka Shōkai in the February 1953 issue of Nihon Camera, p. 104. ↑ Placed in the April 1953 issue of Asahi Camera and reproduced in Kokusan kamera no rekishi, p. 117. ↑ A distinguished novelist — e.g. The Makioka Sisters (Sasame yuki) — essayist, and translator of The Tale of Genji into modern Japanese. ↑ Higher prices from an advertisement placed in the February 1954 issue of Asahi Camera and later one from the May 1955 issue of Ars Camera; both are reproduced in Kokusan kamera no rekishi, p. 117. ↑ "Algen" is mere guesswork, a back-transliteration from a Japanese source that says アルゲン. The name that actually appears may instead be any one of "Argen", "Alugen", "Ulugen", etc. Advertisement by Tanaka Shōkai. Nihon Camera (日本カメラ) February 1953. p. 104. The advertisement is for an unspecified model of Alpenflex (apparently the I or IS and probably the former as a self-timer is not mentioned). Asahi Camera (アサヒカメラ) editorial staff. Shōwa 10–40nen kōkoku ni miru kokusan kamera no rekishi (昭和10–40年広告にみる国産カメラの歴史, Japanese camera history as seen in advertisements, 1935–1965). Tokyo: Asahi Shinbunsha, 1994. ISBN 4-02-330312-7. Items 375–9. Watakushi no ni-gan-refu kamera-ten (私の二眼レフカメラ展, Exhibition of twin lens reflex cameras). Tokyo: JCII Camera Museum, 1992. (Exhibition catalogue, no ISBN number.) P. 26. Alpenflex Model IIS instruction manual in PDF format (English) from OrphanCameras.com website. This page was last edited on 6 December 2018, at 11:42.